Monday night in Miami, Chris Bosh scored the first eight points of Game 4 to spark the Heat past the Pacers. After Bosh’s hot start, Miami never looked back, holding the lead for the entire game, and the team is now just one victory away from its fourth consecutive NBA Finals appearance. Watching those early shots fall must have felt a little bit like an exorcism for Bosh, whose jumper has looked wonky all series long. But for his teammates, Bosh’s huge first quarter probably felt like déjà vu; during Miami’s ongoing dynasty, the Dallas native has had a knack for showing up when his team needs him the most. Unlike Dwyane Wade and LeBron James, Bosh may never win an NBA Finals MVP. But over the past decade, few players in the league can say they’ve had a bigger impact in bigger moments than he has. The Toronto Raptors selected Bosh out of Georgia Tech with the fourth overall pick in the 2003 NBA draft. Four months later, Bosh made his professional debut in a home game against the Nets. He had 11 points and four rebounds. He was 19 years old. Whatever initial psychological adjustments he had to make, Bosh’s early career numbers suggest that he adapted quite well to the NBA game. Upon entering the league, he immediately established a blended scoring approach that incorporated low-post play and an unusually soft midrange jumper. By his third year, he was already a 20-and-10 guy and was selected to his first All-Star team at 21. He has gone every year since. During his time in Toronto, Bosh came to the realization that his childhood visions of the NBA didn’t correspond with reality. His dream of being Toronto’s Jordan never came to pass. The Raptors made the playoffs only twice during his tenure, and exited in the first round both times. Then opportunity knocked. Bosh was presented with a once-in-a-lifetime chance to join forces with Pat Riley, LeBron, and Wade in Miami. In the summer of 2010, at 26, while James publicly weighed his free-agency options, Bosh faced his own decision — one that would define his NBA career, along with those of two other superstars, and the trajectory of two franchises. He could be the cornerstone player and the face of the team in Toronto, or he could accept a less glamorous role in a potential dynasty. The 2009-10 season would be Bosh’s last in Toronto. As a 25-year-old center, he averaged 24 points and 11 rebounds per game — still career highs. To this day, he remains the leading scorer in Raptors history. Bosh moved on to Florida to play with two of his best friends. They just happened to be two of the best players on the planet. Much like his first years in the league, the transition wasn’t easy. Bosh says it took a surprising amount of time and effort to learn how to play and to share buckets with each other. Bosh’s new reality was particularly evident in crunch-time situations. In Toronto, he was the go-to guy in key moments. But Bosh noticed early in his first Miami season that things were going to be different there. Bosh got fewer touches, had to learn to play off the ball more and play the high post all the time. His shot charts show that his opportunities near the blocks and along the baseline took a hit. But what he lost in terms of volume, he made up for in efficiency. He became one of the most effective elbow jump-shooters in the game. His ability to hit 18-footers became a cornerstone of the team’s pace and space tactics. The combination of James’s and Wade’s attacking skills and Bosh’s midrange game made the offense almost impossible to defend. James and Wade would punish teams that stuck on Bosh after screens, and Bosh would punish those that didn’t. Looking back, it’s hard to label the 2010-11 Miami Heat a failure, but that’s how they are viewed after losing to Dallas in the 2011 NBA Finals. The defeat was proof that building an NBA dynasty is not as simple as throwing together a few superstars. That series provided the team with a painful lesson that Bosh now views as an important step in the team’s arc. The 2011-12 season was different. James found a post game and Erik Spoelstra had a new, streamlined offense. Those things helped a lot, but no title comes easy in the NBA, and the 2012 Eastern Conference finals became a legendary dogfight between the Celtics and the Heat. After the Celtics took a surprising 3-2 advantage into Game 6, James played the game of his life to even the series and force Game 7. Bosh, who had just returned from injury in Game 5, came off the bench to make a trio of huge 3s in the deciding game. He went 8-10 from the floor, scoring 19 and making some of the night’s most impactful shots. But it was the big fourth-quarter 3s that got everybody’s attention. Nobody knew he had that range. Except Bosh. When he woke that day, he had a glorious premonition. When we think about that pivotal series, about the Big Three getting over the Boston hump, we think of LeBron and his 45 points. Well, if James’s monstrous Game 6 was the final nail in the Ubuntu coffin, Bosh’s Game 7 was the hammer that drove it in. Two weeks later, Bosh and James had their first championship. The second Heat title run was just as turbulent, but just as he did in 2012, Bosh made a difference in the biggest moments. He was partially responsible for what would become one of the most iconic shots in NBA history. Game 6 of last season’s NBA Finals will be remembered for Ray Allen’s insane corner 3. But that was only made possible by the grace of Bosh. Down by three with 10 seconds left in an elimination game, James missed a game-tying 3-point attempt. If the Spurs had collected the rebound, they would have very likely won the championship. But Bosh intervened and transformed James’s miss into another chance. He gathered the board and calmly made a chest pass to Allen, who was backpedaling to the right corner. Allen drained the shot that he was born to make. The moment not only changed the course of the game and the series, it changed how we talk about the Miami Heat. As James released his errant jumper, Bosh’s attention turned to rebounding. Tim Duncan, the NBA’s active career leader in rebounds, was, infamously, on the bench. Bosh was by far the tallest player on the floor. The ball bounced off the front of the rim, then off the glass, before descending into his outstretched hand. He didn’t panic. After gathering himself, Bosh saw the best thing a player in that situation can see: Ray Allen, open in the corner and calling for the ball. Bosh’s play was the difference between another painful Finals loss and a parade in Miami. It helped them win their second championship in a row and validated the Big Three era. Allen’s shot was amazing for several reasons, but keen observers noticed that, as Bosh grabbed the rebound, Allen backpedaled directly toward the corner, barely looking down to see where his feet were. His head was up almost the whole time. It was no accident he ended up perfectly located in that corner. Allen, famous for his methodical work ethic, had been practicing that exact shot for years. Bosh is now a two-time champion, a nine-time All-Star, and an 11-year veteran. He turned 30 in March. Between playing in obscurity in Toronto and in the shadows of James and Wade in Miami, his unique versatility as a scorer remains generally unheralded. There are two shooting stats from the 2013-14 season that really demonstrate the diversity and potency of Bosh’s game. The first shows just how good he is at scoring near the basket: Of 99 NBA players who attempted at least 300 shots inside of 8 feet, Bosh ranked fourth in efficiency. The Heat have three of the five most efficient interior scorers in the NBA. That says a lot about how well they have come together as a team since 2010. 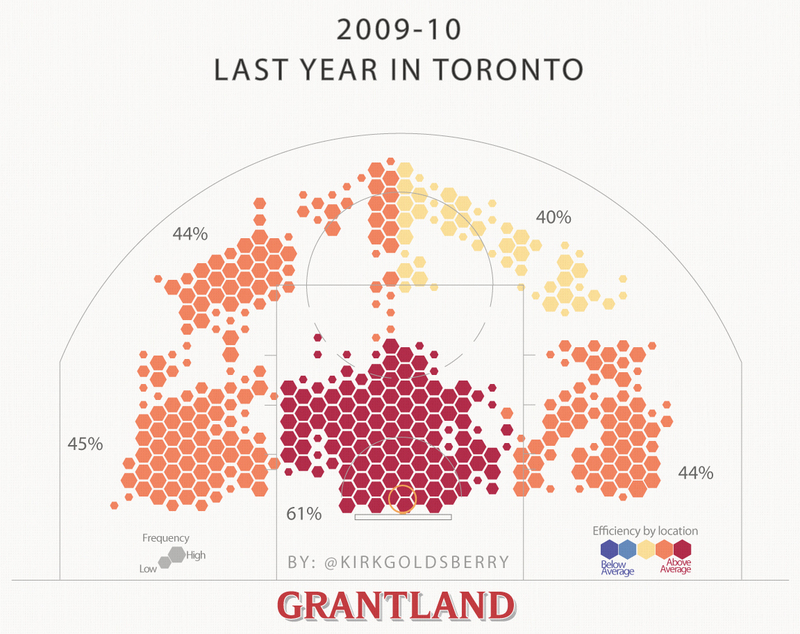 Bosh has always been good near the basket, but in Miami, unlike in Toronto, many of his baskets are assisted. He attributes his strong close-range numbers to his teammates. “That success near the rim speaks to not only their aggressiveness, but their unselfishness and their ability to create for others. Dwyane and LeBron are two of the best finishers in the game, and I’m wide open most of the time,” he says, laughing. That’s pretty good company. And while Nowitzki and Curry enjoy reputations as elite shooters, many people still don’t realize just how reliable Bosh is as well. He takes a lot of pride in his jumper. He’s near the top of that midrange list every year, and he wishes he were at the very top of it. Bosh has never had a shooting coach — he says it’s more about hard work for him. When he started playing alongside Wade and James, he knew that a precise midrange shot was going to come in handy. Taken in tandem, these numbers bolster an argument that Bosh has evolved into one of the most efficient shooters in the NBA inside the arc. However, the same qualities that pushed him to that status drive the ongoing evolution in his approach. This season, after the constant egging on of one of his teammates, Bosh introduced a new wrinkle to his game: a 3-point shot. And it has immediately become one of the biggest factors in this year’s playoff run. After watching Bosh light it up from 20 feet for years, Shane Battier recalls trying to persuade him to extend his range. And Bosh listened. He attempted 218 3-point shots this season, by far the most in his career. During the first two rounds of the playoffs, his newfound range was an important tactical weapon for the Heat offense. Thus far in the playoffs, he has made 42.3 percent of his 3s, including a few huge ones late in Game 4 at Brooklyn. Bosh’s 3-point range seemed like the perfect new element that the Heat’s offense needed to help dilute the ferocious Pacers defense. Bosh’s new range could draw either David West or Roy Hibbert far away from the restricted area and keep them from protecting the rim against attacks from Wade and James. As it turned out, they ran two of their first plays of the Eastern Conference finals to get Bosh shots beyond the arc. He took two corner 3s in the first 90 seconds of Game 1. Bosh missed them both, and missed three more by game’s end. He was off. So were his teammates, and the Heat got blown out. In Game 2, Bosh made only one 3, but the team rediscovered its defensive might to get a split in Indiana. Going forward, Bosh believes his ability to shoot from distance and space the floor will determine who wins this series. Things have worked out pretty well with the new shot so far. Bosh has made 22 of his 52 3-point attempts during the playoffs, by far the most of any power forward. While James and Wade rightly get the adulation and media attention, many continue to reduce Bosh’s role within this ongoing dynasty to little more than a mere footnote. That’s never how Spoelstra has seen it. One thing that’s not different is that Miami is once again in the thick of a title chase. How deep it goes depends on a few things. In a “make or miss” league, just like Game 7 against Boston in 2012, or Game 6 against San Antonio in 2013, these playoffs will likely come down to a few huge shots. Maybe one big rebound. And, who knows, this year it may be Allen throwing the ball to Bosh in the corner.